MICHAEL BÉRUBÉ, the director of the Institute for the Arts and Humanities at Pennsylvania State University, University Park, is the author, with Jennifer Ruth, of The Humanities, Higher Education, and Academic Freedom: Three Necessary Argu­ments (Palgrave, 2015). In 2016 his The Secret Life of Stories: From Don Quixote to Harry Potter, How Understanding Intel­lectual Disability Transforms the Way We Read (NYU P) will be published. This article was first published in the March 2015 issue of PMLA. 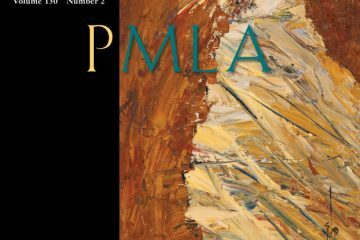 NATALIA CECIRE, a lecturer (assistant pro­fessor) in English and American literature at the University of Sussex, is working on a book project titled “Experimental: American Literature and the Aesthetics of Knowledge.” This article was first published in the March 2015 issue of PMLA. EVAN KINDLEY, a visiting instructor at Claremont McKenna College and a founding editor of the Los Angeles Review of Books, recently completed a manuscript entitled “Critics and Connoisseurs: Poet-Critics and the Administration of Modernism.” This article was first published in the March 2015 issue of PMLA. SHARON MARCUS is dean of humani­ties and Orlando Harriman Professor of English and Comparative Literature at Columbia University. She is completing a book on Sarah Bernhardt and theatri­cal celebrity in the nineteenth century. This article was first published in the March 2015 issue of PMLA.